Free Spirit featuring Deirdre Cartwright and Kathy Dyson. RESISTANCE – 30 years of Blow the Fuse. Carol Grimes is a towering presence in the UK music scene; from busking in the streets as a teenager to touring internationally with the contemporary classical group The Shout and her two solo rock albums in Memphis, it is safe to say Carol is a truly genre-busting artist. Having turned to jazz and blues, her music embraces drama and love. In this special concert to celebrate International Womens Day, Carol is joined by an all-star band of Annie Whitehead, Jessica Lauren and Alison Rayner. Free Spirit – a new duo featuring two of the UK’s top guitarists Deirdre Cartwright and Kathy Dyson. Known for their work in celebrating the music and memory of Emily Remembered, this project celebrates the present. Two guitars with guitar effects, loops and vocal, and interaction with the audience to create melodic pieces and soundscapes. “Kathy Dyson and Deirdre Cartwright are both superb players albeit with contrasting styles that, nevertheless, complement each other perfectly”. Jazz in the House returns for a new season of informal evening concerts this Autumn, with big names playing alongside Lauderdale favourites. Expect modern, world-class jazz in a beautiful historic setting. Please see below for information about our jazz season ticket offer, available until 15 September! Annie Whitehead on Trombone | Alison Rayner on Double Bass | Winston Clifford on Drums | Jessica Lauren on Piano. Carol Grimes performs live as part of Jazz in the House on Thursday 18 October. The bar will be open from 8 pm and the music begins at 8.30pm. Book your season ticket by 15 September to see all nine shows for just £73 (full price £103)! Limited numbers of season tickets are available, so book now to make sure you don’t miss out. To book a season ticket, simply add standard tickets to all nine shows in the season to your basket and the discount will be automatically applied (subject to availability). Or call the box office on 0208 348 8716. Dave Monk A remarkable book – excellent and compulsive read – with the odds heavily stacked against her, Carol’s determination to make it as a singer would make a great film if it could capture the underlying theme of changing times from an era that was almost recognisable as Victorian to the transformation that was rock’n’roll driven by the post-war generation. A few Reviews in the past for performing: “Grimes has a fascinating story to tell.” London Jazz News. “A great UK talent” John Fordham, The Guardian. “A national treasure” Blues in Britain. “The Edith Piaf of British music” Camden Review. “As a woman and an artist, Carol has experienced much, learned more and conveys what she knows in a manner that genuinely connects.” TheVortex. “Expect darkness and light, ugliness and beauty, comedy and tradegy” Cheryl Moskowitz. Anyone who’s ever witnessed Carol Grimes in concert will testify to the fact she possesses a raw emotional power, tempered with the shading of experience and the passing of time. 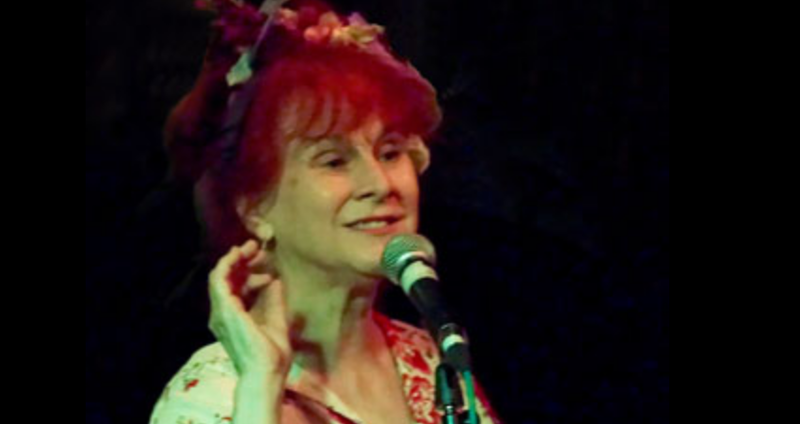 Those lucky enough to have heard her simple yet devastating renditions of Fran Landesman’s “Scars”, or Eden Ahbez’s “Nature Boy” resonating in packed rooms, or jazz stages, will want to read her back story, to find out more. And now, not before time, Grimes has finally produced her autobiography. Titled “The Singer’s Tale” (after Chaucer) it is a wild, candid, sometimes unsparing journey. At times wise-after-the-event and other times laugh-out-loud funny (the Kafkaesque trials of reclaiming a pension once you’ve had several surnames) ~ Carol Grimes is a vivid character one instinctively warms to in the intimacy of these pages. A childhood adrift amongst ration books and bomb-damaged London ~ a quest for identity when significant family members are but faint sketches, old sepia photographs ~ eventually finding her voice and her way. What: A Singers Tale with Carol Grimes & Isabelle Postill, Guesting Forest Voices Community Choir.